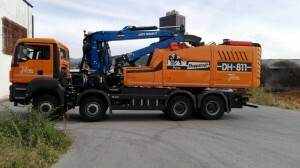 M12RS 02.97, forestry loader crane on Doppstadt chipper. 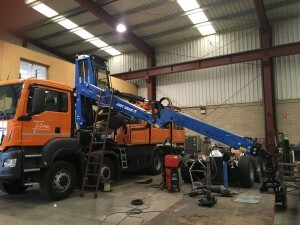 The simple and international design of this L-Type cranes makes RS series reliable, robust and versatile, offering high performances in combination with a great hook clearance. Like the forestry activities require. The installation is enhanced by the cabin. It comes from Scandinavia and is aluminium made, ensuring lightness, strenght and a great comfort for the operator. He is repaired from the bad weather, the noise and first of all he can work safely and protected by wood splinters that could accidentally hit him. 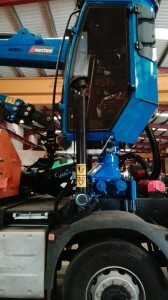 The finishing touches and the machine will be ready for work. So let’s begin the cooperation between Marchesi Crane and T4PRO, spanish importer for Doppstadt.